Yeah! It screams as you sip it, seeming to want to channel a heavy metal rock star in his prime as he puts together a yowling riff on his axe and squeals impossibly high notes into the mike like his huevos were getting crushed. Pow! Biff! Smack! went the rum on the nose. Holy pot still Batman, what the hell was this? I smelled hard, I blinked tears, I coughed out rhum fumes and a hundred flies died on the spot. The maelstrom of clear aggro swirling madly in my glass made me think that if I’d had the St. Aubin Blanc four years ago I would have suspected the clairins of copying them. This rhum was a hellish, snorting magnificent, pummelling nose: olives, brine, vinegar, acetone, salt beef and garlic pork (“wit’ plenty plenty ‘erb,” as my Aunt Sheila would have said), gherkins, sugar water, and more olives, presenting like a real dirty martini. Wow. Just…wow. Though bottled at a relatively bearable 50%, it was fierce and pungent and tasty and wild and definitely left the reservation far behind, just like the white Jamaicans and clairins did. What elevated the experience of drinking it was the sensation of sampling a potent escaped white lightning while at the same time understanding (not without some wonder) that it was totally under the control of its makers (St. Aubin out of Mauritius) and no extraneous frippery of blending or touch of ageing were allowed to mess with the monster’ essential badassery. Some of the salt took a back seat here, the olives were toned down, and in their place emerged sharp and clear notes of wax and furniture polish, leavened by bleeding sugar cane juice, watermelon, swank, pears and a bunch of heavier fruits, hot and just starting to spoil, reminding me more of a Jamaican white like the Rum Nation 57%, or the Rum Fire, or that faithful old standby, J. Wray 63%. Oh but this was not all. Once it settled its hot-snot profile down to manageable levels, came to a sort of grudging equilibrium among all the fierce competing flavours, there was a last cough of cereal, biscuits, oatmeal, salted butter and a dash of cumin to wrap up the show. And it all led to a suitably epic finish that neatly summed up all the foregoing — and so cool that the sun did shine 24 hours a day when I was trying it, and, as the song goes, it did wear its sunglasses at night. See, while furious aggression a la clairin was not quite the blanc’s style, the sheer range of what it presented took my breath away; the balance was damned fine and the range of its flavour profile was impressive as hell. I’ll be the first to admit that such potent whites are not to everyone’s tastes, and if you doubt that, feel free to sample a clairin or three. But man, are they ever original. They burst with crazy, are infused with off-the-reservation nutso, and when you finish one, shudder and reach for the Diplo, then whether you liked it or not you could never doubt that at least it was original, right? That and the bitchin’ cocktails they make, is, to me, their selling point. Because of its pot still origins and because of its relatively manageable strength, I think this thing might just be one of the more approachable whites out there, and I’d really be interested how other drinkers, writers and barflies see it. I make a lot of jokes at Adam West’s 1960s Batman series with their hokey sound effects overlaid on the TV screen and the campy dialogue, but what we sometimes forget is that after all was said and done, even on that series somebody always got hit and somebody always fell down and there was a cool quip at the end. I don’t have a cool quip on this one, but guys, I drank it and got hit and just about fell down. 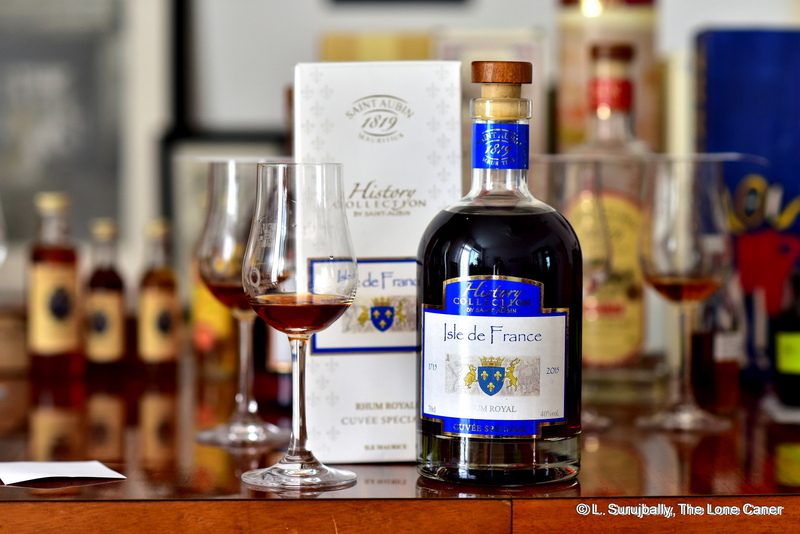 The History Collection 1715 “Isle de France” Cuvée Spéciale, in spite of being made from cane juice, reminded me rather more of an El Dorado rum than a true agricole, and with the History Collection’s 1814 “Mauritius” Cuvée Grande Reserve we’re looking at today, similar thoughts occurred to me…albeit about a different country. Perhaps that’s the marker of a rum that lingers in the mind and titillates the senses – it reminds you of something, but pinning it down proves elusive…and then it turns out to be quite a distinct product in its own right, as this one is. 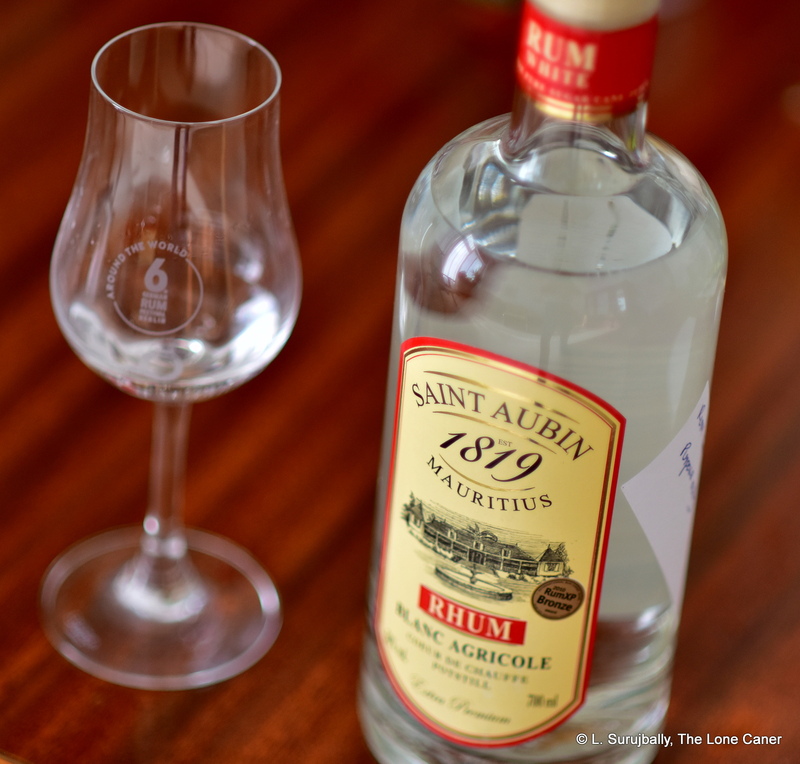 So, that said, and similarities aside, it’s instructive to assess the achievement of St. Aubin in producing a rhum that — even at 40% — was no slouch to sample: it had the same rich and fruity aromas of the Isle de France, brown sugar, cherries in syrup, pineapple, peaches, apricots, vanilla, and to distinguish it from its sibling (perhaps), also a series of coffee and musty, sawdust-y, cereal-y back-end notes. Sprinkled with raspberries. What with a hint of chocolate in there someplace, I was actually moving away from comparing the nose to an El Dorado, and relocating myself to Colombia, know what I mean? This thing was like a crisper Dictador 20 with just enough of the agricole background shimmering through to provide a clue as to its origins. The nose told a tale that would be repeated right down the line, and what I smelled was pretty much what I tasted, with a few variations here and there. It was light and clean, yet displaying darker, muskier spicier notes as well: vanilla, coffee, licorice and some sharp tannins, with the musty long-disused-attic tastes remaining. Some fruits – peaches and cherries for the most part – stayed in the background. The core was anise and sawdust and unsweetened chocolate, and overall it presented as somewhat dry. Quite nice — if it fell down at all it was in the finish, which was more licorice and chocolate, thin tart fruits (gooseberries perhaps) and after a few hours, it took on a metallic tang of old ashes doused with water that I can’t say I entirely cared for. Some background. The date on the bottle (1814) relates to the the Treaty of Paris signed at the end of the Napoleonic Wars by the warring nations of Europe, and it was this treaty which gave Guadeloupe back to France (it had been ceded to Sweden (!!) for a while), but which also formally confirmed Mauritius to be a colony of Great Britain (who had held it since 1810). I was informed that the rhum is cane juice based, 30% pot still 10 year old from 2004, and 70% column still (stored for six years in an inert inox tank), — which therefore does not makes the rum a 10 year old in spite of the bottling in 2014, and so I have had to retitle and amend this post, after checking with St. Aubin directly. Oh and there are 5218 bottles in the outturn, so probably enough for anyone who wants one to get one. As noted on the Ile de France, by the way, you should expect some dosing here (caramel and “natural flavours”, not sugar, I was informed), and that’s evident after some switching back and forth between a true agricole and this one…not enough to mess it up, but noticeable enough after a while. On the plus side it gentles the whole experience down a mite, makes it smoother and quieter and more sippable for those who like softer profiles to their rums (plus of course, sweeter ones); on the negative side it dampens and mutes a profile which doesn’t really need that kind of tampering – it’s good enough as it stands. Underneath the muffling effect of the caramel addition, you can sense what it was and what was there, but it’s like listening to music underwater…the full impact and effect of the symphony is lost. And that’s a shame because I’d be much more interested to see what it was like when pure – based on the quality of what I was sampling, that was probably quite something. As stated above, current versions of the rum are only partly 10 years old, although the components remain the same as older ones – the 10 YO pot still component replaces the 7 YO portion. The label on the bottle I was sold was an older one which is now being changed to eliminate the age statement. So even if your label says 7, you’re not precisely getting that. 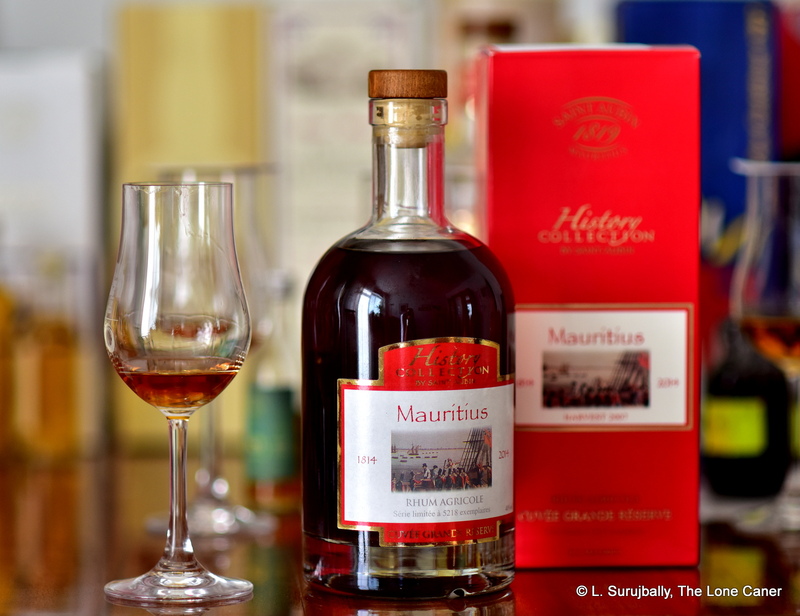 The current focus on the Caribbean’s rums to some extent obscures interesting developments taking place elsewhere – for example the new Madeira rum from Rum Nation, French Guiana’s Toucan…and rums from St. Aubin in Mauritius, which are not particularly new, but certainly lack wider appreciation, perhaps because they don’t make it to the festival circuit as much as others do. 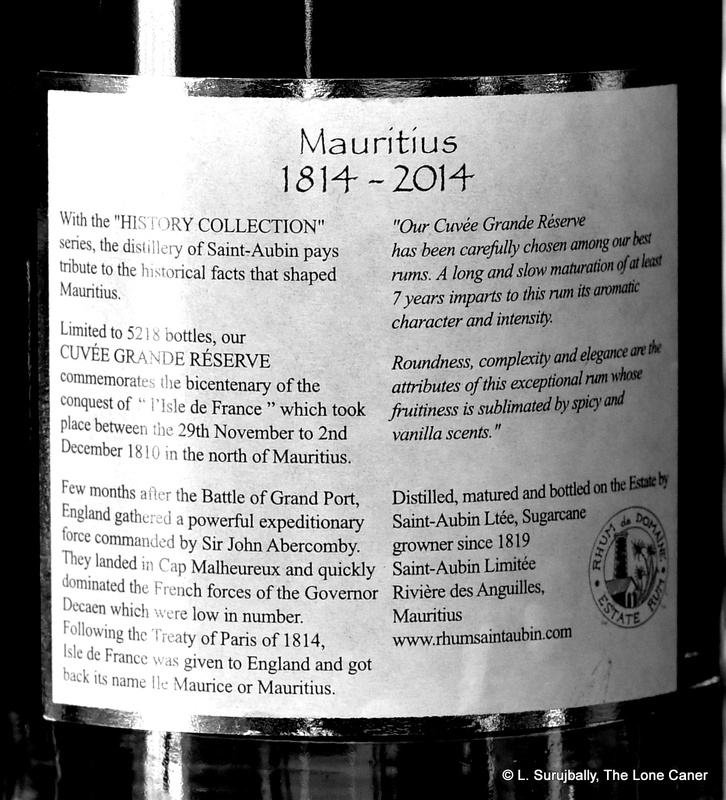 Anyway, this rum, the Isle de France 1715-2015 is part of their “History Collection”, bottled at 40% for a wider commercial market, and commemorates the year of establishment of French rule over Isle de France for the French East India Company — prior to that it was named L’Ile Maurice, and was a haven for pirates, smugglers and the all-round lawless (in which it parallels the Caribbean, maybe) from whom all of us low-rent rum reviewers claim descent when in our cups. According to my email exchanges with the company, the rhum was produced from the harvest of 2005, and is a blend of two rhums – pot still (30%) aged ten years aged in ex-bourbon barrels, and column still (70%) stored in inert inox tanks; both distillates deriving from cane juice . As a further note, although sugar was explicitly communicated to me as not being added, caramel and “natural aromas” were – so some variation from the pure is to be expected and I don’t doubt that hydrometer tests will show the dosage. Certainly the caramel component was noticeable, and not just in the colour, which was quite dark – almost mahogany. The nose presented with sweet toffee notes almost immediately, and what was remarkable about it was also the surprising richness of it all – fruity to a fault, licorice, brown sugar, pineapple and peaches, balanced off (not entirely successfully) with oak and bitter chocolate. The rhum smelled sweet, like overripe oranges and bubble gum and that to some extent was intriguing…just somewhat overpowering after a while. Fortunately it smelled more saccharine than it tasted. The palate was quite good, rather dry, and much more robust than I had been expecting from a standard strength product – sweetish, yes, also containing coconut shavings, pineapple, more peaches, light citrus, caramel and chocolate, coffee grounds, nougat, and – this is where I felt it faltered – also too much vanilla. The oak took a backseat here, the bitterness of the nose not so much in evidence and the finish was warm, short with bubble gum, licorice and dry, woody notes that were pleasant, just disappeared too swiftly. Overall, this is quite a pleasant rhum, and strangely enough, given its cane-juice antecedents, it reminded me a lot of the El Dorado rums, particularly the 12 year old, where the dosage was also quite obvious; and it’s somewhat of a kissing cousin to the El Dorado 15 year old with respect to its panoply of flavours, specifically the licorice and chocolate. I think that attempts may have been made to emulate some of the high ester profile of the Savanna rums without blatantly ripping them off, and the dosage smoothened things out and provided some balance. At end, it’s a perfectly respectable mid-tier rum which is likely to find great favour in North America, perhaps less so in Europe. History always fascinates me, so a few details here: the Domaine de St. Aubin, named after the first sugar cane mill established by Pierre de St. Aubin in 1819 or thereabouts, is located in the extreme south of Mauritius in the Rivière des Anguilles, and has been cultivating cane since that year – however the date of first distillation of spirits is harder to pin down – it’s likely within a few decades of the original opening of the sugar factory (there are records of the Harel family starting a distillery which is now New Grove in the 1850s; they also make the Lazy Dodo brand which I waxed lyrical about last year). 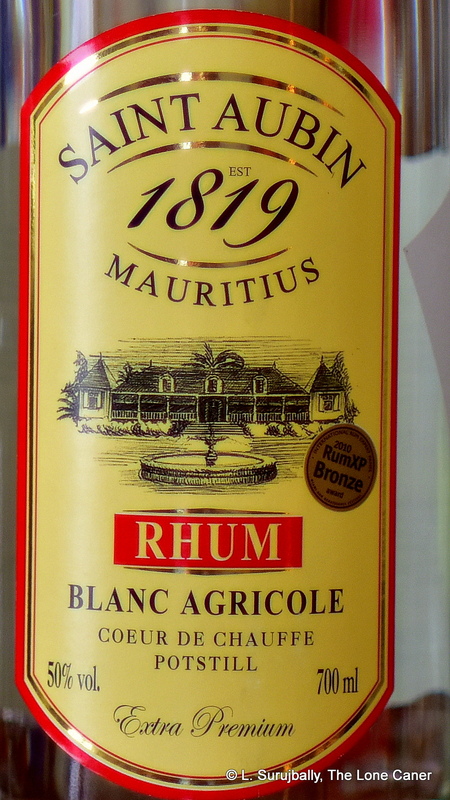 In the late 1960s the Franco-Mauritian Guimbeau family – who made their fortune in the tea trade for which Mauritius is also renowned – acquired the estate and retained the name, and gradually developed a stable of rums produced both by a pot still (which produces what they term their “artisanal” rums) and a relatively recent columnar still for larger volume agricoles. It’s a personal opinion of mine that alongside St. Lucia and Reunion, Mauritius is another one of those undiscovered countries we should be watching. Every day we read about the Jamaicans, Guyanese and Bajans; we regularly get another release from the famous rhum makers out of Martinique and Guadeloupe; and we kinda wish we could get more from St. Vincent and Grenada and other smaller Caribbean islands to round out the area, sure. However, let that not blind you to treasures made on the other side of Africa, on this small, rather-off-the-beaten-track island. Chamarel, New Grove, Penny Blue and Lazy Dodo rums are all good products, enlarging the scope of what rums are — but my advice is, don’t ignore the St Aubin rums either, because however middling my notes are, they have some pretty interesting wares, and deserve a good hard look by those who want something different and tasty, yet also not too far removed from the profiles of better known rums. It’s just close enough to more familiar products to evince a nod of appreciation and vague recall, while being a memory that remains tantalizingly elusive “Tastes oddly familiar,” I wrote after sampling the Cuvée Spéciale, “But damned if I remember precisely which one.” And that’s exactly as it should be.